The Suffolk Coast Path is heading south along the promenade. The Suffolk Coast Path is a long-distance footpath along the Suffolk Heritage Coast, it is 50 miles (80 km) long. It starts in Felixstowe and ends in Lowestoft. It passes through Bawdsey, Snape Maltings, Aldeburgh, North Warren, Thorpeness, Minsmere, Dunwich, Southwold and Kessingland. Lowestoft, correctly pronounced Lows-toft is a coastal town in Suffolk. The town is on the North Sea coast and is the most easterly point of the United Kingdom. It is 110 miles (177 km) north-east of London, 38 miles (61 km) north-east of Ipswich (the county town) and 22 miles (35 km) south-east of Norwich. It is situated on the edge of the Broads system and is the major settlement within the district of Waveney named after the main river with an estimated population of 58,560 in 2010. Some of the earliest evidence of settlement in Britain has been found in Lowestoft, and the town has a long history. It is a port town which developed due to the fishing industry, and a traditional seaside resort. It has wide, sandy beaches, two piers and a number of other tourist attractions. Whilst its fisheries have declined, the development of oil and gas exploration in the southern North Sea in the 1960s led to the development of the town as a base for the industry. The town has recently begun to develop as a centre of the renewable energy industry within the East of England. Lowestoft consists of the small parishes of Kirkley, Pakefield, Carlton Colville and Oulton Broad to the south of the harbour and Normanston, Gunton, Corton and Oulton to the north. The harbour, and Lake Lothing creates a distinct north - south divide in the town and the harbour or Bascule Bridge is a perpetual problem causing traffic chaos within the town when open for pleasure yachts and shipping. Lake Lothing provides access via Oulton Broad and Oulton Dyke to the River Waveney, Beccles and the Norfolk Broads. 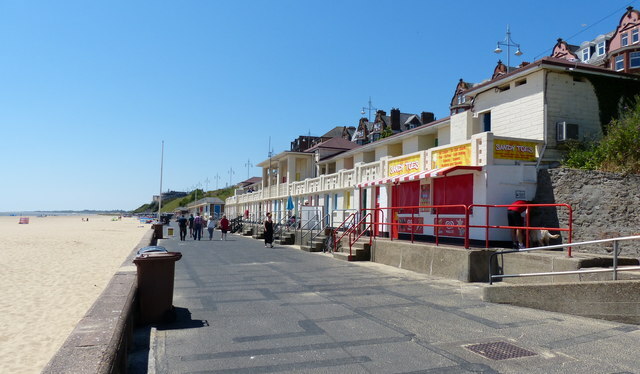 Lowestoft is mainly low lying, although there are areas with steep cliffs in the north of the town where the highest points are 20–30 metres above sea level. Some marshland remains west of Oulton Broad. The beaches to the south of the harbour are sandy and have Blue Flag status. North of the town is an area of sand dunes known locally as the Denes, as well as more beaches. Ness Point, the easternmost point of the U.K. lies between the two. Lowestoft has been subject to periodic flooding, most notably in January 1953 when a North Sea swell driven by low pressure and a high tide swept away many of the older sea defences and deluged most of the southern town. Heavy rain caused flash flooding in the town in September 2006. December 2013 storm surge caused severe flooding of Lowestoft and its suburbs in December 2013. Lowestoft is in one of the driest areas of the United Kingdom and receives less than 600 mm of rainfall a year on average. Rainfall is fairly evenly distributed throughout the year. Summer temperatures will tend to reach 21 °C in August, when the town averages over 200 hours of sunshine, whilst in winter minimum temperatures average 2 °C. Significant snowfall is rare. Sea fog (scud or harr) and cool onshore breezes occasionally but rarely affect the town during the summer months. ©Copyright Mat Fascione and licensed for reuse under this Creative Commons Licence.